Japanese sports manufacturer Asics have created quite a buzz in the world rugby scene the last few months. Generally one would associate Asics with running or possibly even tennis, but rugby not so much. Those days are long gone my friends. There’s a new kid on the block. Asics have arrived and have made it clear, they intend to become a household name in rugby too. Asics signed Australian Rugby last year and of course our beloved South African Springboks, whose contracts came to an end with BLK and Canterbury respectively. Asics are now the official apparel sponsors to Springbok Rugby and will be kitting the South African teams out for the next 6 years, which of course includes the 2015 World Cup in New Zealand. 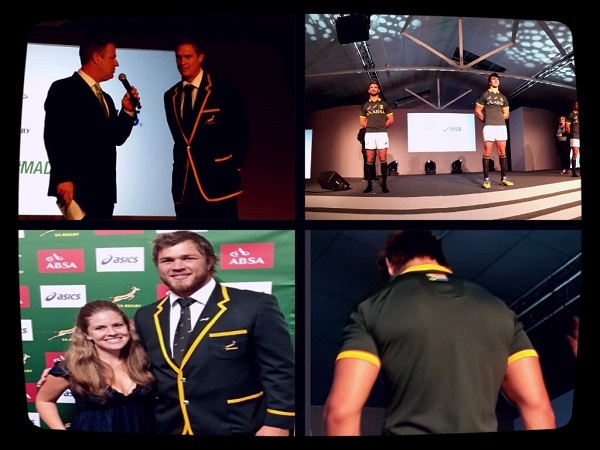 Last night (24 April) I was lucky enough to make it to the launch of the new Asics Springbok Jersey at the Lookout in Cape Town. While sipping on cocktails on the deck, the excitement was electric, as Springbok player’s ad coaching staff made their way through the crowd of people. Following the twitter campaign in the build up to the launch #madeofsa , its been very apparent that this kit is ALL SOUTH AFRICAN. 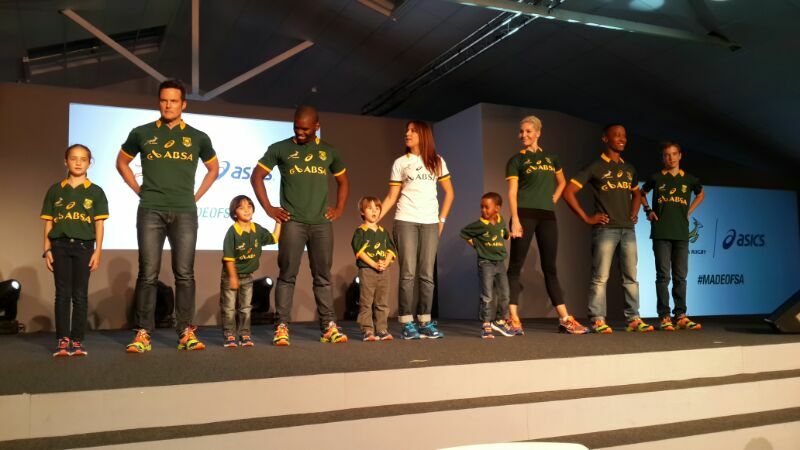 The theme throughout, and message reiterated by all, was the new Asics kit has been made in South Africa, by South Africans, for South Africans. Once inside the venue, Matthew Pierce jumped straight into it. I’ll skip all the speeches and all that jazz and get to the point here. A big part of this sponsorship deal was that it HAD to be made in South Africa. Asics have set up a magnificent factory in Durban and are in the process of doing the same in Cape Town, which is pumping out replica left right and center. As with all replica in South Africa, the jersey is not exactly the same as the player’s jersey but is distinctly thinner than most replica- that is actually quite nice. That being said, it was kept very much on the down low that the actual playing kit is being produced in Italy but Asics are looking at possible way to produce the same quality, for the same price here in South Africa, but that wont be happening over night. 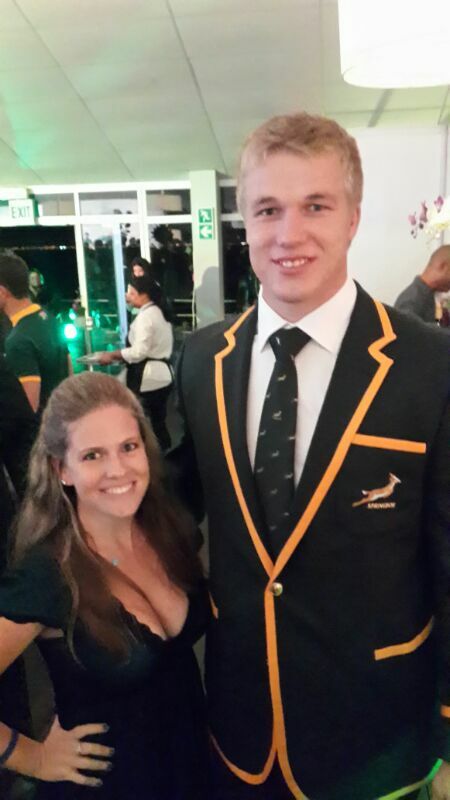 A very patriotic Jean de Villiers got the crowd really revved up and feeling very Proudly South African. When asked about what wearing the Green & Gold means to him, ‘It’s this unbelievable type of magic. It’s just a beautiful jersey and its amazing to be able to wear the Springbok jersey.’ He went on to add, ‘ we will go on to be number 1 in the world, we will beat the All Blacks and we will do so in Asics kit.’ This of course went down very well. Again, the Springbok Captain echoed the earlier sentiments of how wonderful it was that South Africans for South Africans make this kit in South Africa. As pointed out by the CEO of SA Rugby, Jurie Roux, South Africans are all sorts of crazy about the green and gold… so much so that the April Fools joke with the red and gold jersey had to be cut at 9 am that morning instead of 12pm because of the response they got. So of course Asics stuck with the very traditional green and gold. The home jersey is predominantly green with golden trimmings. It is an incredibly technically designed jersey. There are track pads across the chest, which helps with traction, making carrying that little bit more secure. Moisture management fabric, a 4 way stretch fabric, a GPS system in a pocket just below the collar on the back… just in case any of the players decide to go on a cheeky run around of course (We are all thinking Bismarck here right?). The shorts have been made with chamois panels on the side as well as a very slippery material strip on the bottom of the shorts, which will help ‘shake off tackles’. Both the shorts and jersey fabric feels far thinner than most other rugby kits. Time will tell whether or this one comes back to haunt them or not. 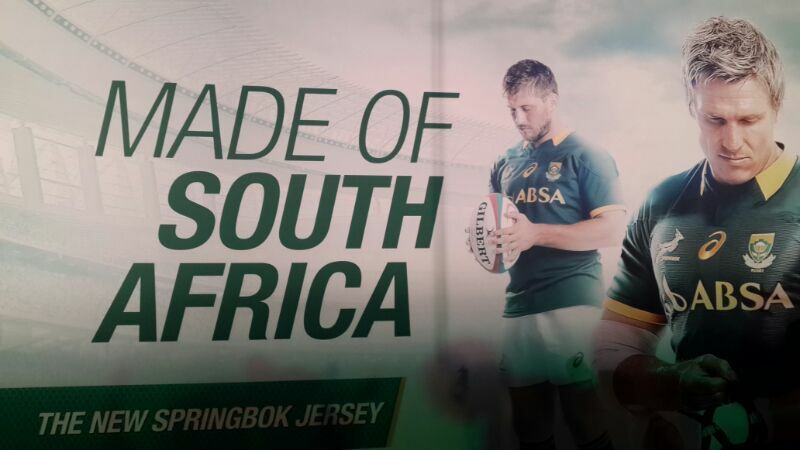 Willie le Roux, Eben Etzebeth and Juan de Jongh made lovely models of the new playing kit. One thing I found somewhat interesting though, was that the Super Rugby jerseys have a far tighter fit than these do. So it’s great that you have all this technology behind a jersey, but if it’s not tight-fitting, it is without a doubt easier to get a grip onto a bunch of material versus the tight-fitting one. Also, there was no mention about thicker paneling or longer shirts for front row players to help with binding or anything like that. When asked about it, the question was bounced, which of course didn’t impress me all too much. There were a huge number of Springbok players in attendance, as mentioned by Jean de Villiers, due to the large number of injuries. The players were great in interacting with the media. In chatting to Jacques Fourie, he did make mention that the jerseys are not as tight-fitting as previous jerseys like the 2007 World Cup Jersey sponsored by Nike. ‘The kit looks great and it really is an exciting time for Asics and Springbok rugby where I think both brands will develop really well together.’ Fourie was full of praise for the new apparel sponsor. On a slightly different and in some what very refreshing way, Pieter Steph du Toit really didn’t seem too fussed about the technicalities that were the talk of the night. ‘Honestly, I just want to go out there and play rugby. I don’t know how the kit is all made and its great that it is so technical, but that doesn’t matter to me as much as just going out there and doing what I love does.’ Jinne mense, hoe oulike is dit?! A number of the Springbok Sevens players made a guest appearance too. Frankie Horne, Kyle Brown and Justin Geduld entertained the media. I was absolutely blown away by the down to earth nature of these guys compared to most of the 15 a side Springboks. What a breath of fresh air! ‘Asics have done a huge amount research into how the game is played, the physicality of the game, physical aspects of the players in certain positions. It’s great that there has been so much attention paid to detail and that we are so well looked after. The kit looks and feels great and it’s really exciting to be playing in some pretty cutting edge stuff.’ Frankie Horne had all the time in the world to chat and was really very frank (no pun intended) about life in the Sevens Team. The general vibe about the kit was that it’s been really well done and the technical aspects brought into the kit is really something else that has taken the kit to a whole new level. The kit is lovely but I can’t help but notice that there was no player’s away kit, no men’s away replica or children’s away replica. The only away ‘kit’ was that of a very classy looking ladies white replica jersey. A lovely touch that was added last night, everyone that attended the event got a personalized replica jersey. There was even an embroider that was doing extra jerseys for anyone who wanted.